Many communities in Asia have toiled hard for generations simply to survive. Some men and women haven’t had the privilege of pursuing an education themselves, and they are helpless to give one to their children. But God loves these children deeply, and He is working in part through GFA’s Bridge of Hope Program to give them a chance for a better future. Bridge of Hope gives more than 70,000 needy children a daily meal and regular medical checkups for their physical health and development. The program helps the children with their education so they can one day get a good job and afford sufficient food, decent clothing, medical supplies and other necessities of life for themselves and for their families. Beyond this, Bridge of Hope provides the children with opportunities to pursue and even excel in their God-given skills and interests. Bridge of Hope staff members are the hands and feet of Christ to the students and their families, serving them with genuine love, compassion and respect. They maintain relationships with the parents and children and offer them counsel, encouragement and, ultimately, give them hope. Through Bridge of Hope, God is enabling these children to become all they possibly can be, so they can one day be a blessing to many others throughout Asia. A young girl who lost her parents, but was given hope. A beggar woman stood with a child in her arms, asking for something to eat. "Why are you exploiting this girl?!" the man in front of her charged. He, a cook for a GFA-supported Bridge of Hope centre, knew many beggars carry small children to entice larger handouts. They use this tactic only to pocket most of the money for themselves. But to his surprise, the elderly woman broke down in tears and began pouring out her heart. The child in her arms was her granddaughter, Daya. The little girl was once happy, but strife tore her family apart. Daya's father began to beat her mother badly. He had no love for his wife, and neither parent had any love for Daya. It wasn't long before he abandoned the family and married another woman. Sadly, even Daya's mother deserted her, so her grandmother was the only one left to care for the abandoned girl. With no income, they began begging at bus stops, train stations and shops. Now, they stood eye to eye with a cook who was hesitant to give a handout to another adult he thought was exploiting a helpless child. The cook was moved with compassion when he saw truth welling up in the eyes of the grandmother. He invited her to enroll Daya in the Bridge of Hope centre, where he could cook the young girl meals for many years to come. Daya joined the Bridge of Hope centre wedged between a railway station and a slum. Even there, she stuck out as the poorest of the poor. Having lived much of her life in the slums, she knew little of hygiene and came to class in the same dirty clothes each day. On the rare occasion when she did bathe, she didn't use soap. Some parents began pressuring the Bridge of Hope staff to drop Daya from the program. They didn't want this dirty child around their sons and daughters. They even threatened to remove their children from the centre if she didn't leave. Daya's future hung in the balance. If rejected from the Bridge of Hope centre, she would return to the streets as one of the hundreds of thousands of child beggars in Asia. At some point, she would likely join the 20 to 30 million other boys and girls there who are exploited as child labourers. With only her grandmother to protect her from predators in the slums, she would be at risk of becoming one of the millions of children abused as prostitutes. Worse yet, if her grandmother died, all hope would be lost for her future. But even if Daya did escape these evils, where would she find a loving atmosphere that would help her thrive? Because the staff knew God had brought Daya to them, they made the decision to keep her in the program—no matter what the consequences would be. The staff members tackled her hygiene problem head-on. They scrubbed the 8-year-old down and gave her new clothes; by the time they were finished, she was almost unrecognizable. The staff continued to teach her and her classmates proper hygiene, along with other practical life skills. It's been more than six years since Daya joined the Bridge of Hope centre. Today, Daya wears the beautiful dresses she and the other girls are given as their uniforms. She's not begging on the streets. She's not in bonded labour. She's not enslaved in a brothel. She's not helpless. Daya has hope for her future and peace in her heart. With the education she receives at the Bridge of Hope centre, she has done well academically and wants to become a teacher. GFA-supported Bridge of Hope centres bless entire communities, not just students. The care given to the children and their families helps ease financial and emotional burdens, enabling families to gain greater stability and peace. What’s more, Daya's grandmother experienced God’s love through the kindness shown to her granddaughter. More than 70,000 children like Daya have the opportunity to gain a bright future through Bridge of Hope centers, but millions of others still live in despair. Help transform their world by sponsoring a child. You can make an incredible difference in the lives of children and their families through GFA’s Bridge of Hope Program. For each $38 monthly pledge you make, you’ll receive the photo and personal information of a child you can pray for, write letters to and build a relationship with. By God’s grace, your sponsorship can impact the rest of their lives. Through you, the child you sponsor and their family will gain a far brighter future, and many will experience incredible love. 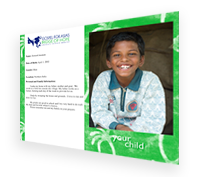 Sponsor today and receive a packet that includes a child’s photo and personal information, along with letter-writing materials, which will give you an opportunity to form a relationship with your child. We have been impressed with GFA's focus on all the needs of the child and with the accountability level of the ministry, as well as the endorsement of leaders such as Francis Chan. I am so grateful that Gospel for Asia operates with so much integrity and respect for the culture and people. It is so interesting to explore all the aspects of this ministry. Thank you for being faithful disciples of our Lord.